Since 1857 in Trossingen Germany, HOHNER has produced musical instruments like harmonicas, accordions, melodicas, recorders, guitars and ukuleles of the highest quality. A highly motivated staff produces top quality musical instruments for the entire world. Legendary harmonicas such as the Marine Band or premium accordions like the Gola and Morino are only conceivable thanks to the skill and experience of our instrument makers. In the factory, state of the art manufacturing methods and precision tools are united with the highest levels of craftsmanship. Only the finest quality raw materials are used, obtained from worldwide leading suppliers. Every instrument from HOHNER embodies not only the decades of experience and enormous treasury of knowledge of our staff, but also the aspiration to build the best possible musical instruments, driven by an abiding passion for music. 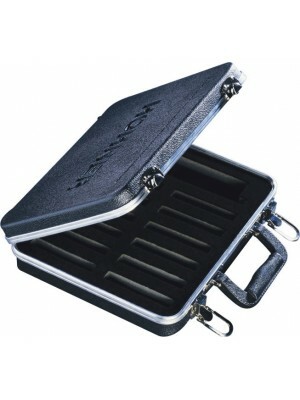 The Hohner harmonica carrying case ensures protection of your harmonicas during transportation. ..